For anyone else wanting to give a small-batch of sticky buns a try, the dough is easy to prepare, a matter of stirring the ingredients together. While the recipe did not call for kneading the dough once it comes together into a shaggy ball, I gave it a few presses and turns in the bowl to smooth it out before letting it rise. Roll the dough into a 10x6 inch rectangle. I found my dough rather sticky and looking back, I'd dust the dough with flour and knead it a few times before rolling it out. After rolling, I slathered 2 tablespoons of softened butter over the rolled dough, which I halved from the original recipe. I think 2 tablespoons is enough in this case. This small-batch recipe makes 4, fairly sizable, sticky buns. While the small-batch recipe I use for cinnamon rolls also makes 4, they are smaller and can be baked in a 6-inch cake pan. These sticky buns are bigger and need more room to expand so you can use an 8-inch cake pan like I did or, if you have a jumbo muffin pan, you can nestle them individually in the pan as originally intended in the recipe. For the filling and topping, this recipe calls for a total of 1/2 cup brown sugar, along with 1/2 cup chopped walnuts, plus a pinch of salt. I placed about 1/3 cup of the mixture into the bottom of the pan, then dotted it with a total of 2 tablespoons of butter. This will make for that sticky caramel top that defines the sticky buns. I started with 1/4 cup of the mixture into the pan but added a bit more to fill it up. As I mentioned, I was afraid I wouldn't have enough topping but it worked nicely and I thought it was sufficient. If you're using a jumbo muffin pan, place about 1 tablespoon of the mixture into the bottom of each of the 4 cups. The remainder of the sugar-nut mixture goes into the filling. There's actually no cinnamon in the recipe and I thought about adding it but in the end, I didn't. If you like, feel free to add some ground cinnamon, or even some orange zest into the filling. Roll the dough up from the short end into a log, as tightly as possible (mine were not all that tight), then slice it into 4 equal pieces, each about 1 1/2 inches tall. My dough was a bit wet and sticky so I had to handle with care, nestling them best I could into the pan. If using a jumbo muffin pan, place each into the prepped muffin cups. Do ahead: As with cinnamon rolls, I stop here, cover the pan with plastic wrap, and set it into the fridge overnight. In the morning, I take them out for a second rise, for about 45 minutes or so. Then, bake for 20 minutes at 375 degrees. You'll see the sugar bubbling from the bottom of the pan as it gets done. Once out of the oven, let the buns cool a few minutes in the pan. Learn from me and run an offset spatula or knife around the edges of the pan to loosen the buns from the sides before flipping the pan around and releasing the buns onto a plate...hopefully, your sticky buns will all turn out neatly, unlike mine. As my husband pointed out, sticky buns are supposed to be sticky and messy so however yours turn out, that's how it's supposed to be! I say it's all good as long as it tastes good, and I say these tasted very good. Make the dough: In a measuring cup, combine the water and yeast together; add a pinch of sugar, stir lightly to combine. Let sit in a warm spot until foamy, about 5-7 minutes. If the yeast does not foam, it's dead and you'll need to start over. Melt 2 tablespoons butter and set aside to cool slightly. Stir the melted butter into the foamy yeast mixture, then stir in 2 tablespoons of sugar. Pour this mixture into the flour in a medium bowl. Stir until a soft, shaggy dough forms. (It's not required but I turn the dough and softly knead it a few times in the bowl to make a smoother ball.) Place dough in another lightly buttered bowl (or use the same one that you've wiped fairly clean and greased), flipping it around so that both sides are coated with butter. Cover the bowl and let it rise in a warm spot for 45-60 minutes, or until doubled in size. Make the filling and prep rolls: Combine the walnuts, brown sugar, and salt together in a bowl. Take 1/3 cup of the mixture and spread it evenly in the bottom of an 8-inch round cake pan (alternatively, use 4 cups of a jumbo muffin pan and place about 1 rounded tablespoon of the filling down into each cup). Take 2 tablespoons of the softened butter and cut it into about 6 pieces and dot them around the pan. Bake and serve the sticky buns: If continuing with the recipe immediately, let the rolls rise again in a warm spot for about half an hour. Preheat oven to 375 degrees. Bake for 20 minutes. Remove from the oven, let pan cool a few minutes, then run an offset spatula around the sides of the cake pan to loosen up any stuck edges. Turn the pan around onto a large plate, letting the caramel drizzle over the buns. Serve immediately. You are such an amazing baker! I've never tried, nor eaten, sticky buns, but I want to. You're my baking hero! These look fantastic Monica - great job! What a great idea of baking a small batch of sticky buns. They look amazing! Thanks, Bal. I had to get it out of my system since I'd been thinking about it a lot. I adore sticky buns! These look fantastic, Monica and I will definitely double the batch! Funny enough, I'm with Tricia in that I've tasted sticky buns once at Flour Bakery (in Boston)...they're known for them. And I can't think of another time I've ever eaten them! They do look incredibly delicious! And I just love your small batch recipes. They are perfect for a small family like ours and way less intimidating when you don't have to deal with large amounts of ingredients. Love that crunch form the walnuts. So happy that you need to get this baking thing out of your system so in the mean time we get to enjoy all of your delicious treats! I am loving your small batch recipes, they are the perfect size for my husband and myself and wouldn't you know it sticky buns are my husbands favorite of all, will be surprising him with a batch, he will be tickled. Thanks Monica!!!! Oh boy, I bet you enjoy the ones from Flour! Such a great bakery. Reading your post and seeing your pictures make me drool. I love this kind of cinnamon rolls or buns and made them quite often myself but, like in your case, I have never made sticky buns until now. I definitely should! Gah Monica you are killing me with this post! haha Making me crave these sticky buns! I have been on a walnut kick lately - these sound just perfect!! Oh these look too good. I really like that you made a small batch, such a good idea! I love the thought you put into baking, Monica.The whys and hows and tweaks of an enthusiastic and talented baker! Your self-control with small batch recipes always awes me as well. 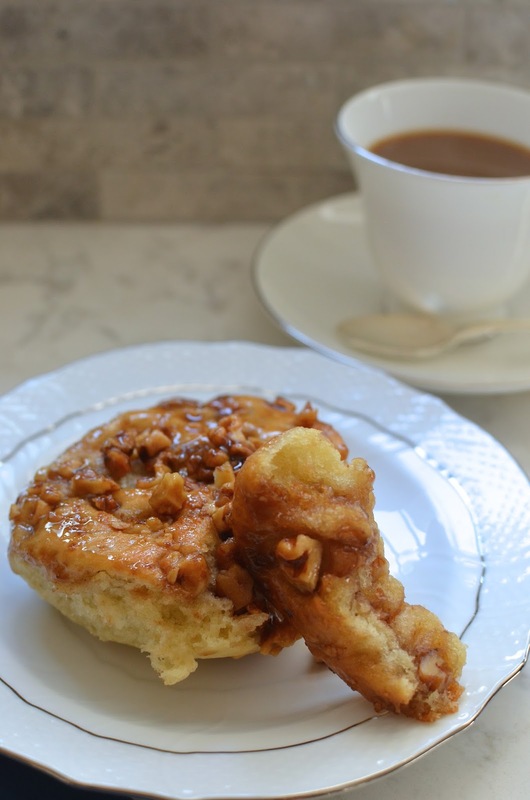 Though I will leave out the nuts (maybe use cocoa nibs for crunch), I would love to give these sticky buns a try! Thank you for putting such a nice spin on my musings. : ) It's hard not to over think things sometimes. Not sure if it's a good or bad thing but it's worth it to experiment and sometimes go with your gut. Hope you are having a great summer, Wendy.